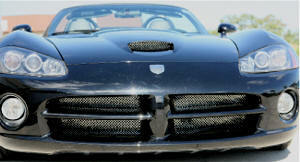 Front End Covers help protect from bugs, dirt & other road debris. Designed to securely fit the contours of the front end, this high quality cover features 2-piece construction to allow the hood to be opened without removing the cover. Vinyl material with 22-oz foss polyester backing will not harm painted surfaces. All Black with Silver Viper Logo. (2) Dodge Viper SRT/10 (2003-2010) Deluxe Chin Scratch Guard - Complete Protection! 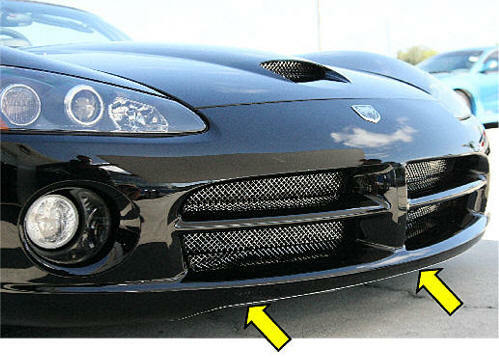 This custom made all stainless steel chin guard protects under your lower Viper front end against parking stops, curbs, inclined driveways, and road debris for the life. Easy mounting peel and stick application. 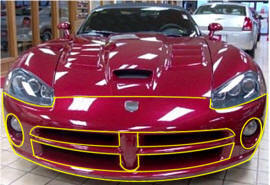 Includes five (ready to mount) vinyl protection strips as shown. Also includes five additional replacement strips. Nearly invisible from the front end. Stops the scratches and nicks and bug bites! 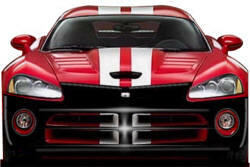 Highest Quality Paint Protection film is a nearly invisible, "always-on" alternative to bulky and often problematic vinyl front-end protectors. You have to be close to the vehicle, and look hard, to spot this stuff. As with vinyl bras, it offers protection from stone chips, insects, small scratches, and the wear-and-tear sand-blasting effect from years of driving. Instead of having to remove and reinstall a bra after every foul-weather encounter (which can trap dirt and moisture underneath), paint-protection film is semi-permanently installed, similarly to window tint. It has a lifespan of about seven years and requires no special maintenance. Should the need arise, or when the film wears out, it can be replaced. And you can wax it along with the rest of your car, minimizing bug and sap stains and easing stain removal. - Computer cut from 8Mil paint protection film. - Contains UV protectants to counteract ultraviolet rays and to resist yellowing. - High-performance, pressure sensitive adhesive that ensures excellent adhesion to OEM paints. Don't like mud flaps? Not for this ride! 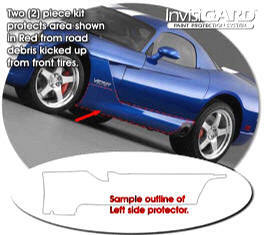 Protect the complete rocker areas between each wheel well of your 2003-2009 Dodge Viper Coupe or Convertible. 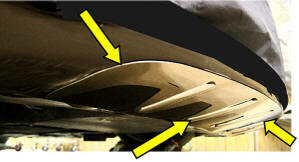 High Quality long life clear vinyl panels with this easy-to-install two (2) piece precut Rocker Panel Protector kit. These areas chipped already? No problem! Carefully treat the chips with factory touch-up paint and install the pieces when dry. InvisiGARD's ultra-gloss urethane surface will make these areas appear new again. Our InvisiGARD paint protection film is an optically clear urethane film that is a proven product to protect your vehicle's vulnerable areas from paint damage caused by bug acids and road debris such as tar, stone, gravel, sand and road asphalt. Don't like mud flaps? Not for this ride! 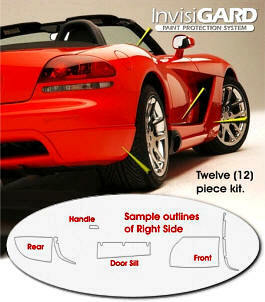 High quality Protect the rocker areas of your front and rear wheel wells as well as the Door Sills and Door Handles with this easy-to-install twelve (12) piece Wheel Well & Door Sill Protector kit.